One of the most overlooked nutrients affected by exercise is water. 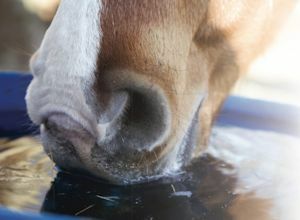 A horse can ingest water either by drinking or by eating moist feed, which can contain anywhere from 10 percent (hays/grains) to 80 percent (fresh grass) water. A horse loses water through urine, feces, the respiratory tract and sweat. Lactating mares will also lose water through milk. Loss of water through sweat is greatly affected by the environment, because a horse will lose 1 to 2 gallons of sweat per hour of moderate exercise at temperatures below 68°F and up to 3 to 4 gallons per hour at temperatures above 86°F. To maintain proper hydration, an exercising horse should consume 10 to 20 gallons (or more) of water per day. Ensuring that water buckets and troughs stay clean and providing adequate electrolytes through the diet will promote water intake and help prevent dehydration.